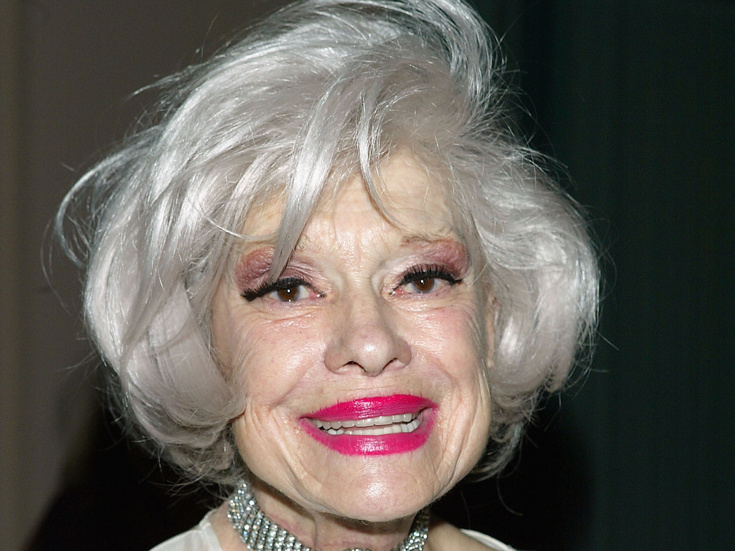 Carol Channing, the stage icon whose indelible turns in the musicals Hello, Dolly! and Gentlemen Prefer Blondes put her on the map as a Broadway legend, died on January 15 at her home in Rancho Mirage, California. According to The New York Times, Channing had suffered a pair of strokes in the past year. She was 97. Carol Elaine Channing was born on January 31, 1921 in Seattle, Washington. She attended Bennington College in Vermont, soon after landing her first Broadway job, the musical comedy Let's Face It! (1941). She went on to accrue a variety of Broadway credits, including Proof Thro' the Night (1942), Lend an Ear (1948) and her first star turn, as Lorelei Lee in Gentlemen Prefer Blondes (1949). She followed up that performance with an appearance as Ruth Sherwood in Wonderful Town (1953) and an acclaimed turn in The Vamp (1955), earning Channing her first Tony Award nomination. Channing turned heads when she debuted the role of Dolly Gallagher Levi in the original production of Michael Stewart and Jerry Herman's Hello, Dolly! (1964). Her delicious portrayal of the matchmaker hoping to find love for herself earned Channing a Tony Award for Best Actress in a Musical. Channing became iconically known for the role, later reprising her beloved turn in two revivals (1978 and 1995). 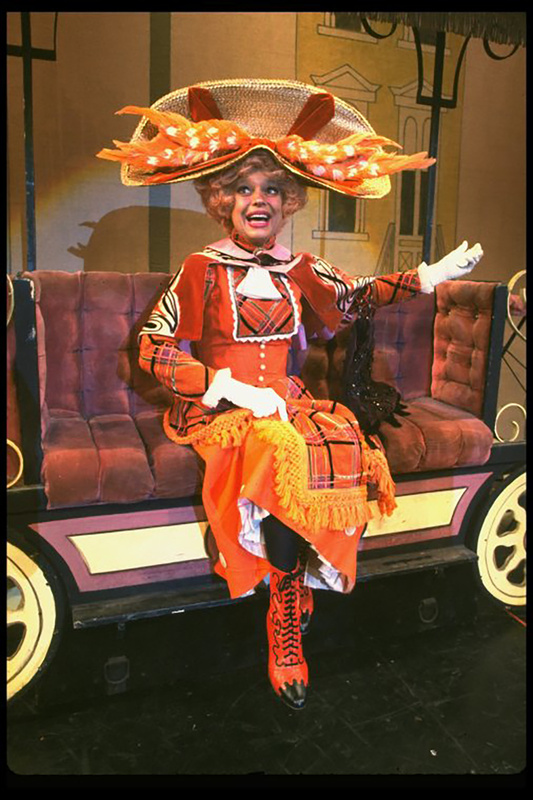 Carol Channing in the original 1964 Broadway production of Hello, Dolly! The one-of-a-kind star earned acclaim in the film world with an Academy Award nomination and a Golden Globe Award for her performance as Muzzy Van Hossmere in the film Thoroughly Modern Millie (1967). Channing starred alongside Julie Andrews and Mary Tyler Moore in the movie, which was later adapted into a Tony-winning musical (2002) featuring Sheryl Lee Ralph as Muzzy. Channing's extensive Broadway résumé also included turns in Show Girl (1961) and Four on a Garden (1971) as well as a Tony-nominated performance in Lorelei (1974), a revision of Gentlemen Prefer Blondes. In 1960, Channing was honored with a star on the Hollywood Walk of Fame. She was presented with a Special Tony Award in 1968 and a Tony for Lifetime Achievement in 1995. In 2002, Simon & Schuster published Channing's memoir, Just Lucky I Guess. In 2011, Channing's personal life and career were charted in the documentary Carol Channing: Larger Than Life. Channing was married four times, to Theodore Naidish, a writer; Alexander Carson, a football player with whom she had her son, Channing Carson; Charles Lowe, her manager and Harry Kullijian, her junior high school sweetheart, who passed in 2011. Channing is survived by her son. In a 2002 interview with Broadway.com, Channing summed up her devotion to the stage: "From the crib on, I lived my life in one line and never got off it," she said. "I never went on a tangent. Like someone would say, 'Ooh, you paint very well in class. You should be a painter.' And I said, 'Uh uh. I'm not gonna get side-tracked.' Once I tried it out, once I finally got onstage, I realized, 'This is it. This is what I need to do.'"